I just had the pleasure of being interviewed by consummate antique dealer Nate Ivey of Crescent City Connection Etsy shoppe and Blog of the same name. I discussed my history with antiques growing up on the hunt with my mom in New Jersey estate sales and how that early love of antiques has grown into my business The Antique Flâneur where I perform all types of appraisals, source antique and vintage items for interior designers and private clients and also assist clients in the selling of their antique objects. You can read the interview here on the Crescent City Connection Blog. Happy New Year & All the best for 2019!!!  Is Silver Archaic and Obsolete? Today silver is seen as an unnecessary or extraneous item that is not needed for one’s home and table. Whether sterling or plate, no one wants to care for silver or polish it. The belief is that silver care is difficult, arduous and time consuming. And of course silver cannot go into the dishwasher or the microwave. Few modern brides register for a silver pattern for their wedding these days. Perhaps there are a few holdouts in the South. A good stainless set is the way to go. 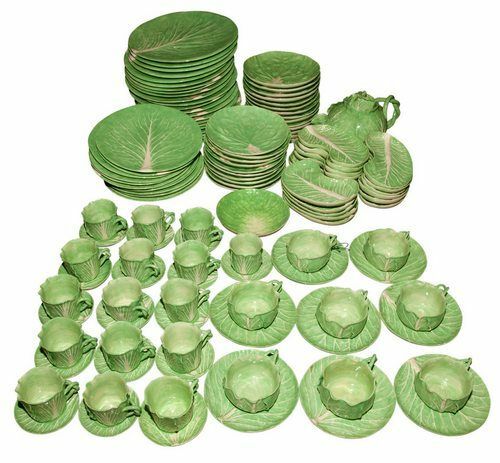 It can be used every day as well as for special occasions because no one uses special occasion china or flatware any longer. Growing up, I always loved it when my mother was preparing for a birthday or holiday meal all my eager help of course. We used the good plate flatware from my grandmother and gently polished it. Out came the good china from the vintage Louis XV style cupboards. A linen cloth and complementing napkins were chosen. The quite tall pair of Reed & Barton plate candlesticks also from my grandmother were given a last minute shine to illuminate the table. These fond memories from my childhood aren’t enacted much by the younger generations today, but I continue my mother's traditions in my own house. I set a mean table even when I am just having a few people over for dessert and coffee. I select antique Rococo inspired or Neo-classically themed porcelain plates with a coordinating flatware whether in sterling or plate. My guests always appreciate my efforts and there is always discussion or questions about a certain pattern or style. I'm sure there are a few other silver holdouts like me out there in the world. 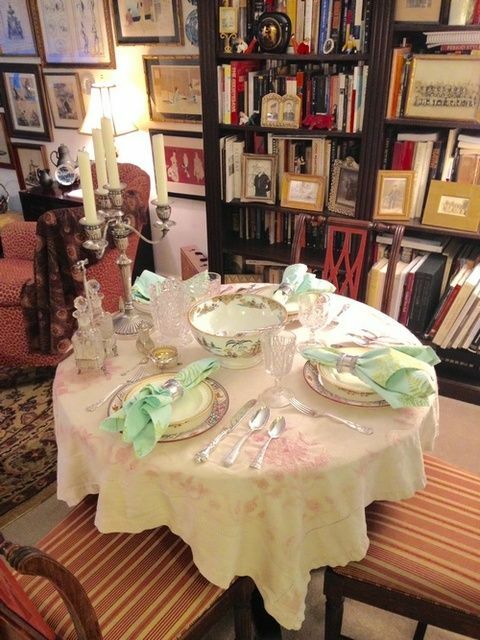 Here is my table recently set for a simple luncheon. As my mother always says, "Give me a cheese sandwich, but on a pretty plate." Mostly I suspect when people think of silver, they think it has to be a fussy, elaborate, overwrought, 19th century and Victorian. But that is simply not true. 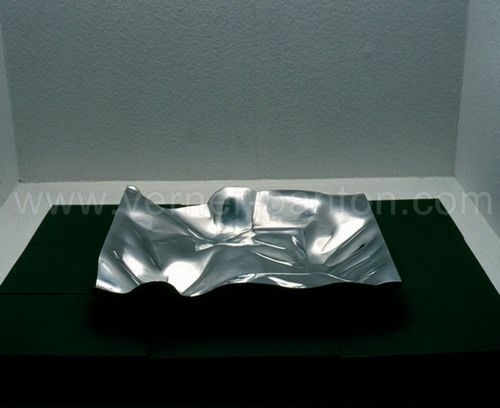 Take a gander at the novelty Georg Jensen silver centerpiece designed by Verner Panton manifested as a crumpled piece of paper from 1989. Superb and so unexpected and so casual. Imagine this piece on your simple and traditional dining table with some interesting, even 19th century candlesticks. The contrast would be dynamic. The piece measures 4? x 22? x 18?, a perfect size for a centerpiece. Silver can also have a sense of humor. 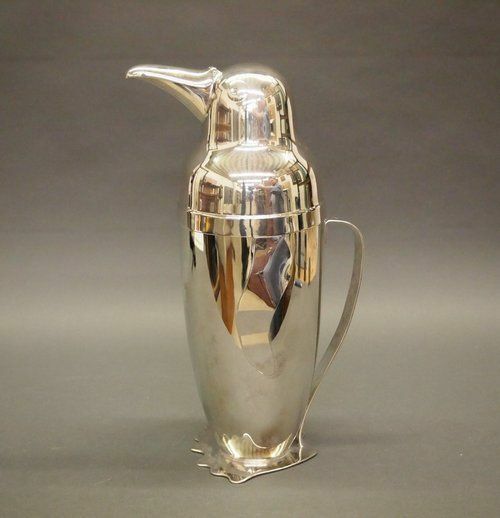 How about an Art Deco Napier Silver Penguin Cocktail Shaker circa 1936. What could be more fun than penguins and cocktails? And a frosty tub of ice in a 19th century Gorham sterling silver ice bucket! Gorham produced some wonderfully sleek and modern design pieces. In 1958, inspired by the launch of Sputnik and the Apollo moon mission, Donald Colflesh designed a tea and coffee service entitled Circa 70 for Gorham in Providence, RI. 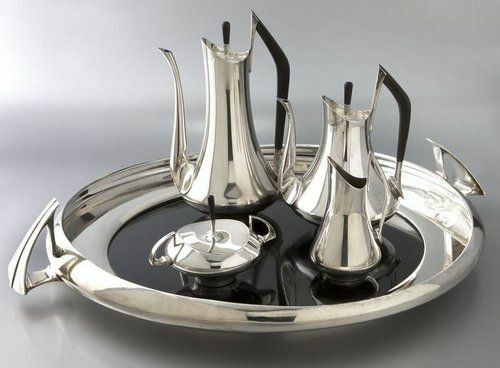 This set from 1965 features a coffeepot, teapot, sugar, creamer and tray with a great futuristic look and a contrast between the ebony handles of the pots and the base of the tray and the sterling silver. 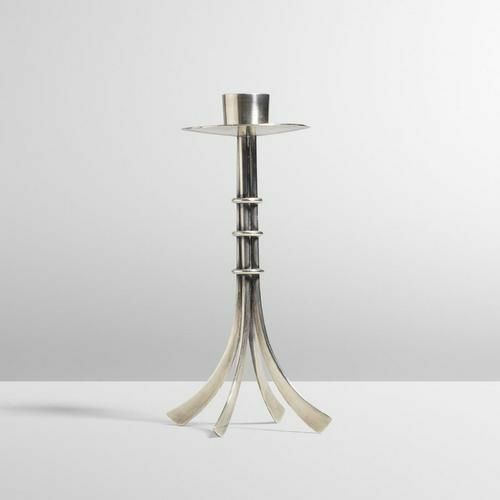 Colflesh also designed for Gorham a pair of Circa 70 3-light candelabra, 1960 (8.25? H x 9.25? W). 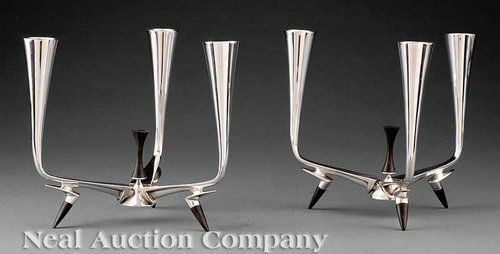 One can see the influence of the Space Program on these pieces as well particularly in the contrast between the sterling silver and the ebony finial and feet. This candlestick pair looks like some kind of robotic rovers about to scurry across the lunar surface. 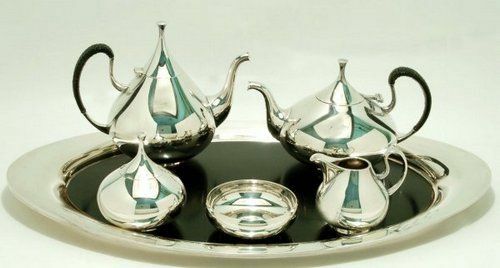 Yet, do the Circa 70 sticks and tea and coffee set continue to evoke a modern feeling 57 years after their production? Or does their evocation of the moon landing create a sense of nostalgia and loss for a space program that no longer has that ambition. Not modern, but past. 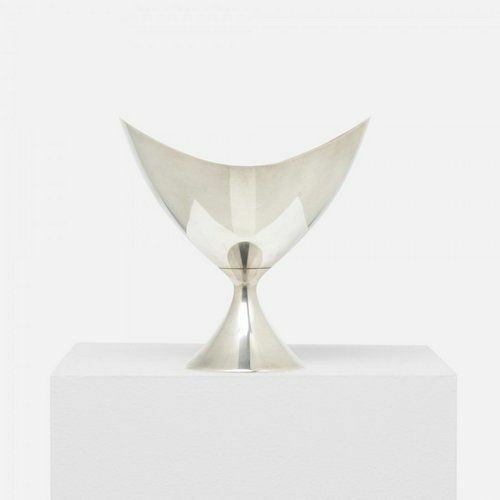 For me, it oscillates between the two which makes these pieces of 1960?s silver even more dynamic and more modern to my eye in their fluctuation not their date of production and design or philosophical considerations. 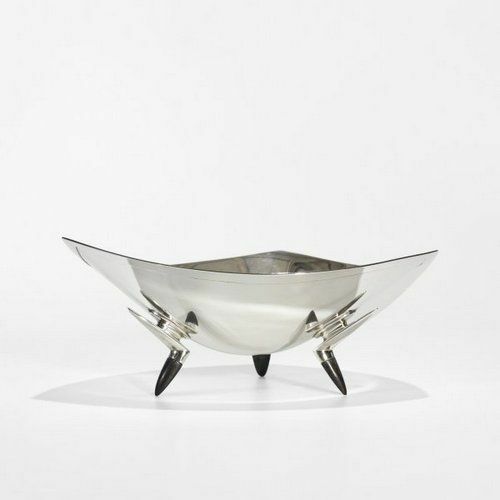 Colflesh Delta Bowl from the Circa 70 series for Gorham, 1960, sterling silver and ebony, 5" x 12"x 12"
Colflesh Contour Bowl from the Circa 70 series for Gorham, 1958, sterling silver, 7.5" x 7.75" x 6.5"
And one does not have to spend a great deal to achieve a modern silver look. Silver is available at all price points; it is just having a good eye and a degree of taste to find interesting pieces to impart the look you are trying to achieve. And of course there is always silverplate which is often at a lower price point as well. The silverplate designs of John Prip for Reed & Barton can be found especially at auction at reasonable prices. Prip combined Danish design and harmony with the American desire for innovation. This dynamic is demonstrated by his silverplate Dimension tea and coffee service with a tray with a black lacquer inset made for Reed & Barton. The fluid, organic and bulbous nature of this set standing in contrast to the black lacquer ground of the tray is pleasing and modern at the same time. 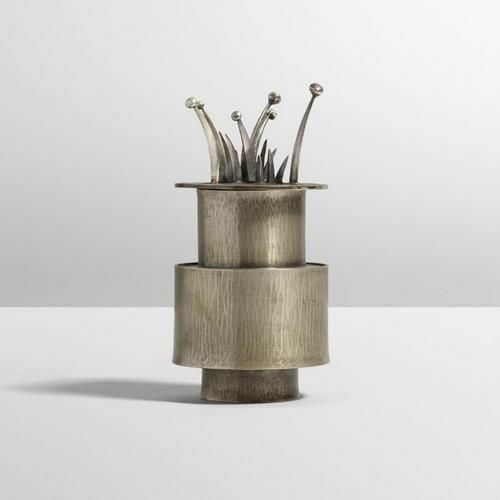 Prip continued this modern, organic dynamic in the following 2 pieces of holloware: a circa 1950 7" tall sterling candlestick and a circa 1960 sterling and nickel 6" tall lidded box. The candlestick stands on 4 legs that continue seamlessly into the shaft of the stick and resemble like the split ends of a branch. The cover of the box is sprouting some out of this world sterling fronds. If you would like my help in finding a silver item or items for your home and table, please contact me at [email protected] and check out the Services page of my website to see how I work with clients. If you have some silver and need an appraisal of your pieces for insurance, estate or donation etc, please contact me. Welcome back to Auction Finds of the Week from The Antique Flâneur. This week's auction finds looks at 6 furnishings being auctioned off at the Doyle Home Sale on 29 June 2016 in New York City. The Doyle Home Sale is similar to a large estate sale which is filled with all types of objects: artwork, furniture, ceramics, glass, metals and so on at usually good prices. 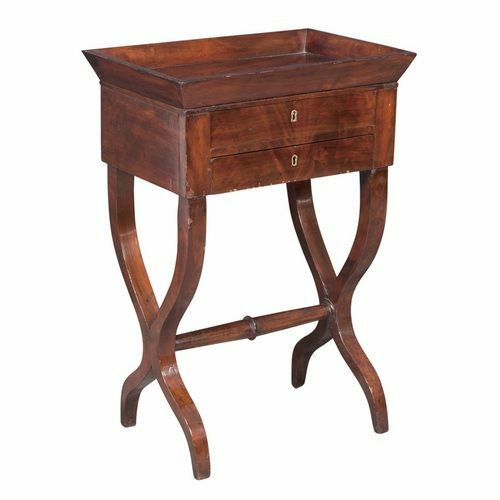 In the sale there is a mix of period pieces and many items in the style of or style. Always remember when you look at a lot described as for example in the style of Louis XVI or Regency style it was not made in the 18th century during the reign of the Bourbon king or during the time of George III. Rather items listed in that manner have been made at a later date. Now, let's check out the furnishings from the Doyle auction. 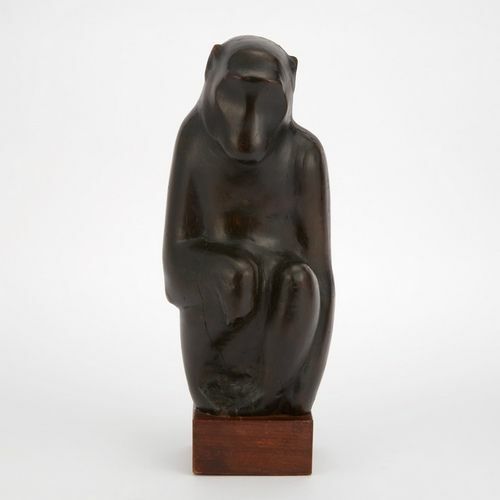 The first find this week is lot 23, a sculpture entitled Monkey Wood by the Ukrainian artist Joseph Constant (1892-1969) with a pre-sale estimate of $700-1,000. The piece is 13" tall without the wooden base. The listing does not indicate when the sculpture was made, but my guess is that it is from the 1920's or 30's, since the monkey has a vaguely Art Deco feel in the simplification of its form. It is the composition of the monkey that I find most appealing and I could see it on a sideboard or on one end of a mantelpiece. The second discovery this week is lot 197, a Regency style mahogany three-tier etagere on brass casters with a pre-sale estimate of $300-500. 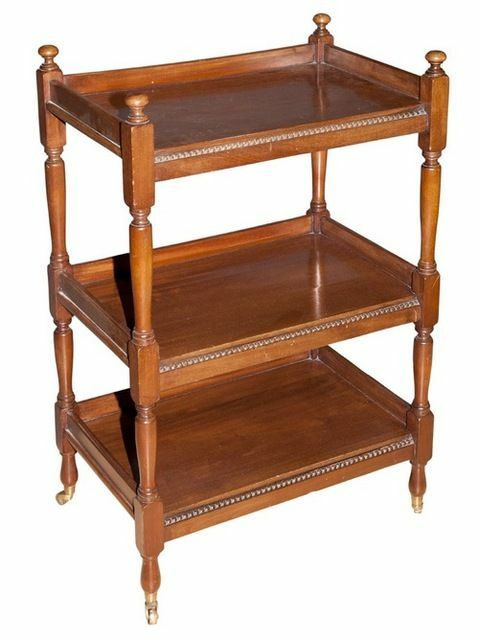 The etagere measures 36" high x 23.75" wide x 15.75" deep. With these measurements this piece of furniture could be tucked in anywhere and with 3 shelves it is quite functional. Use it as a side table with a lamp in the living room. Or put it in the bathroom stacked with nice, fluffy tiles. This piece has a myriad of uses while still maintaining an attractive look. Do you need some stylish storage in your home that is more than just merely functional and utilitarian looking, but full of warmth and charm? 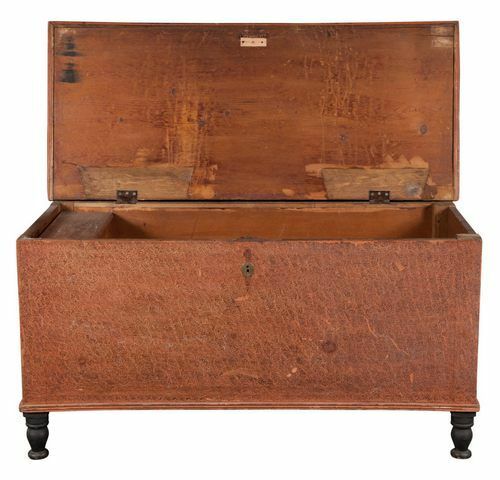 Lot 215 is an American sponge painted blanket chest standing on turned legs with a pre-sale estimate of $400-600. It must be either 19th or early 20th century in date. It has a lovely subtle reddish patina that would look wonderful in a bedroom to store pillows or blankets. The chest measures 49.5" wide, so it has ample room. Style and function together. The fourth treasure this week is lot 216, a Dodie Thayer and other makers cabbage form pottery dinner service consisting of 125 pieces with a pre-sale estimate of $2,000-3,000. What an incredibly wacky dinner service, but still possessing wonderful color and form. In a large kitchen a Welsh cupboard filled with this service would be quite striking! 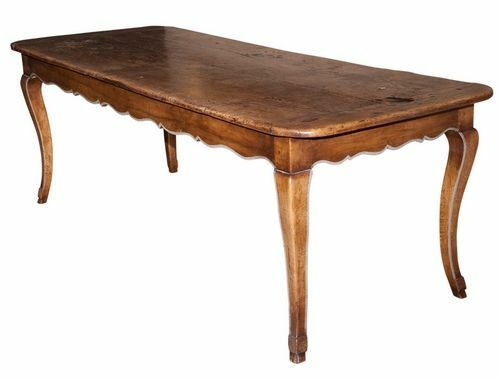 The fifth find this week is lot 224, a French Provincial style pine farm table with a pre-sale estimate of $1,200-1,800. The table is a nice, big size, measuring 29.5" high x 7' wide x 34" deep. It looks to have a nice patina. The cabriole legs and undulating apron work well together and are quite pleasing to the eye. 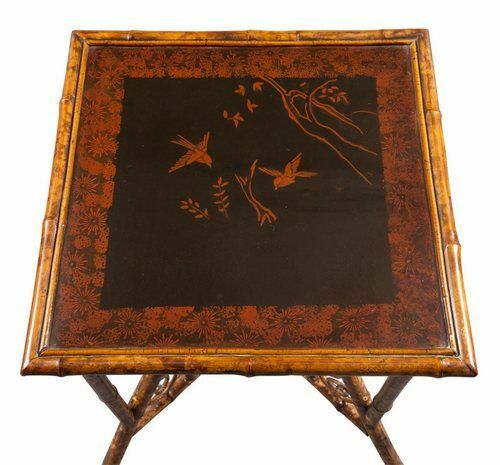 The next discovery this week is lot 255 most likely a late 19th century Aesthetic Movement side table with a bamboo base and a lacquered top decorated with 2 orange birds in flight amongst foliage against a black ground. The table has a pre-sale estimate of $200-300. It measures 27" high and the top is 23" square. Very decorative, the table would work well holding a metallic lamp in a living room perhaps. The final find this week is lot 300 an Empire mahogany vide poche with a pre-sale estimate of $600-800. A vide poche is basically an empty container placed near the door to hold the contents of an individual's pockets when they arrive home. 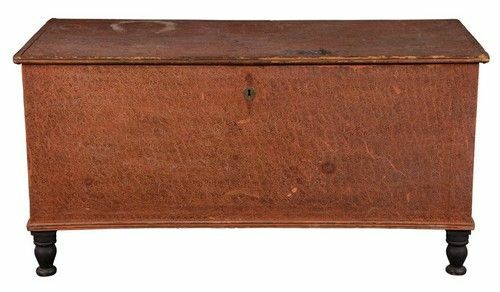 A vide poche can take many forms and this Empire mahogany example is particularly stylish with the large tray top to hold keys, mail etc. The tray is over 2 drawers and the whole is on X-shaped legs with a stretcher between them. The piece measures 28" high x 19" wide x 13" deep. It's small size makes it perfect to be tucked into a foyer or entrance way to perform its duty. I hope you enjoyed this Auction Finds of the Week. 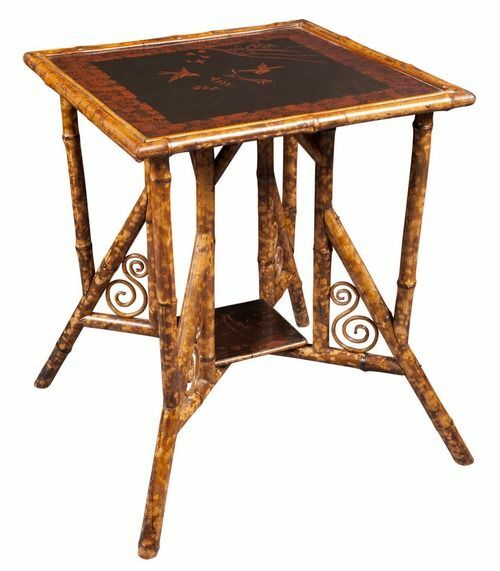 Attractive, stylish and functional furnishings can be found at many auction houses that hold estate sale style sales just like the Doyle Home Sale. If you are looking for a decorative object or a functional and pleasing piece of furniture, I can help you find it. Check out the Services page on my website to see how I work with clients in helping them find a unique and special object for their home. I am also an accredited appraiser in silver with the Appraisers Association of America. I am USPAP compliant and can meet all your appraisal needs. Again take a look at the Services page on my website to see how I perform appraisals and work with clients. AUCTION FINDS OF THE WEEK- JUNE 24TH: WHAT'S COOKIN' IN THE KITCHEN IN CINCINNATI, OHIO? Welcome back to Auction Finds of the Week! I have been quite busy lately with a variety of consignments of antique and vintage items. If you have antique and vintage items that you would me to sell for you, please contact me at [email protected] and take a look at the Services page on my website to see how I work with consignments. This week I found 8 antique and vintage items that I think would look wonderful in a kitchen/great room or just simply a kitchen. These objects will add charm and interest to a place that is often the heart of the house both for families and guests especially if the kitchen is expanded into a great room as is often seen now in newer construction. Vintage and antique pieces can give a sense of permanence and warmth to these large, new spaces. All the finds this week are from Cowan's Auctions in Cincinnati, Ohio from their Spring Americana and Decorative Art Sale which is taking place on 24 and 25 June 2016. 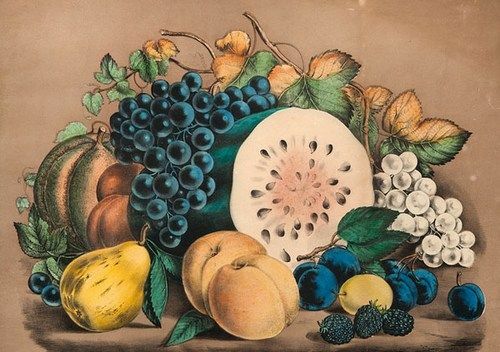 This week's first find, lot 163, is a pair of Currier and Ives hand-colored lithographs of fruit entitled Summer Fruits and Autumn Fruits. Each print measures 12.25" x 17.5" unframed and date to the second half of the 19th century. Pictured here is the print entitled Autumn Fruits. You will notice that the bunch of grapes on the right has not been colored. While some might see this lack of color there a drawback, I think it imbues the lithograph (there are uncolored grapes in the Summer Fruits print too) with a certain charm and naivete of the hand done and the unfinished. The pair of lithographs have a pre-sale estimate of $200-400. With their bright colors and rendering of fruit I think they would look great in any kitchen. This week's second discovery, lot 208, with a pre-sale estimate of $250-500, is a pair of four color jacquard coverlets (1 pictured here) made in Ohio in the mid-19th century and signed by Dennis Cosley who was born in 1816. Each coverlet is in red, blue, green and white with rose medallions and lovely fruit and flower basket borders. The design of both is rich and intricate, yet not overpowering. 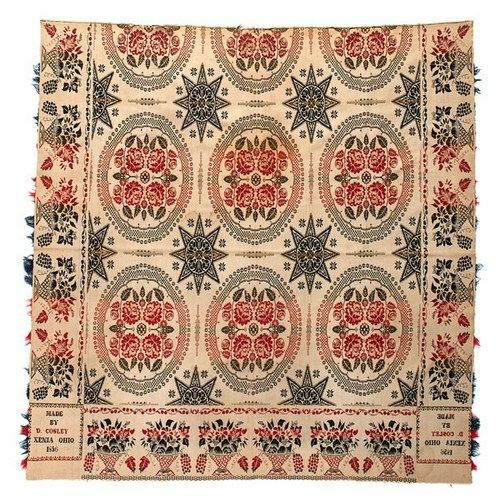 One of the coverlets could be used as an intriguing wall hanging for a great room attached to a kitchen. It really couldn't be hung in the kitchen itself where it would absorb all the smells, smoke and gunk from cooking. This week's third treasure is lot 242, with a pre-sale estimate of $200-400. It is a whimsical vintage advertising item from the early 20th century. 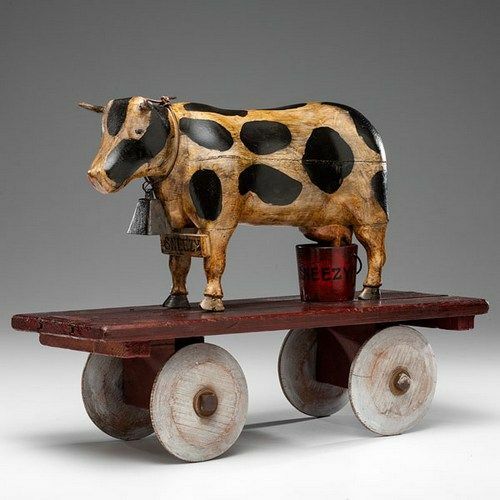 An advertising display features a standing cow with a bell and bucket on a wheeled cart. The cow is labelled Sneezy underneath the bell which must be his name and affixed to the cart is metal plaque for the Snee Dairy Co. of Pittsburgh, PA. The whole piece measures 18" high x 24" long. Why not put Sneezy on the big kitchen island for some added interest. Or if there is a mantelpiece in the kitchen/great room make Sneezy the centerpiece. A wonderful piece with great character. The fourth discovery this week, lot 247, with a pre-sale estimate of $200-400, is another advertising item- a delicatessen trade sign from the 20th century and originating in Dayton, OH. The wooden, hanging sign has a rectangular form with stencilled black and green letters on a cream ground. The sign is 12" high and just over 6 feet long. What a bold piece for a kitchen or over the mantel of a great room. The graphic quality of the sign feels quite modern and would work even in more sleek kitchens of all stainless steel. This week's fifth find is my favorite of the 8 finds although it does not have great age, provenance or value. Lot 253 is a stencilled wooden hanging spice cabinet with a pre-sale estimate of $200-400. The spice cabinet has 4 drawers with porcelain pulls over a lower lift-top compartment. Each drawer has an internal divider and each is stencilled with the name of some ingredient like cloves or allspice. I think it is charming and would have it on my kitchen wall in a hot minute. It's a sweet decorative piece that is also functional. What's a kitchen without a stylish rooster? 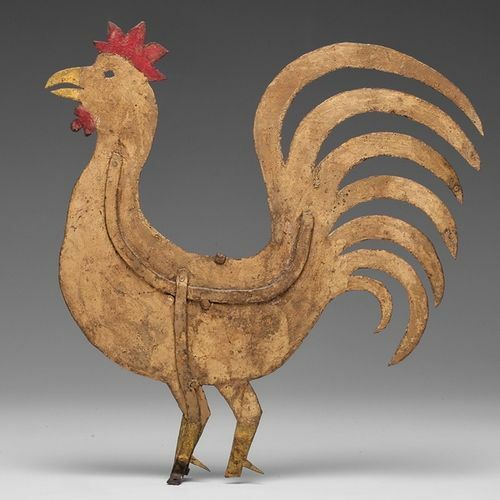 Lot 294 is a painted rooster weathervane with a pre-sale estimate of $200-400. Proudly standing 18.5" tall, the weathervane is made of sheet metal and is painted gold with red accents. It looks like something homemade in the garage and even though the surface probably isn't original, it has a wonderful presence. Hang it in the kitchen over the stove or put it on a great room's mantelpiece. The sixth discovery this week is lot 379, with a pre-sale estimate of $150-300. 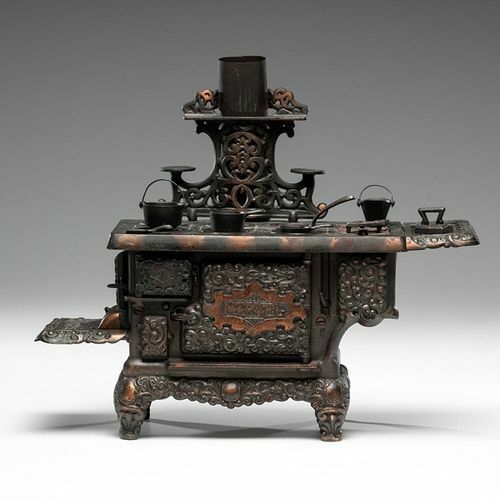 It is a small scale Kenton Marvel toy stove made of cast iron with copper highlights. It is a sweet, small size only being about 13" wide. It has the look of an antique stove with lots of detail. A great accessory for the traditional modern kitchen. The final treasure this week is lot 704 with a pre-sale estimate of $600-800, a wonderful painting called The Quilters by the American painter Frank McElwain who was born in 1942. The Quilters was painted in 1994 and measures 23.5" x 29.5" sight. The work depicts 3 women in hats working on a large quilt outside under an arbor. It seems to be scene of a bygone era. There is quiet sense of purpose to their work. 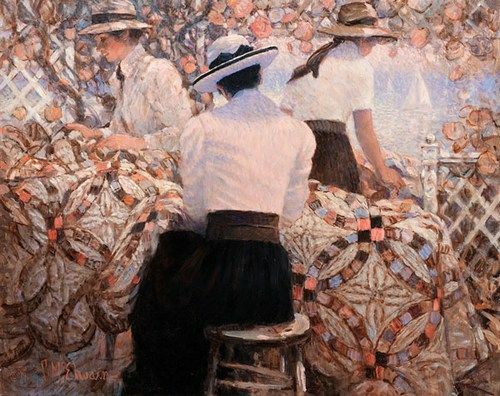 McElwain creates an overall abstract pattern with the color and texture of the ladies' blouses, the quilt and the flowers on the arbor punctuated by the black color of the ladies' skirts. I think it is a wonderful idea to have a painting such as this one in your kitchen or great room. I hope you enjoyed this installment of Auctions Finds of the Week. When designing your kitchen or great room, try to add some vintage or antique objects to give the space warmth and distinction. Even if your kitchen is totally sleek and modern and full of stainless steel, why not add a great vintage advertising sign like the delicatessen sign above that has some history and a patina. It will be a great counterpoint to the smooth, hard stainless surfaces. If you are looking for a vintage or antique item and you would like me to assist you, please check out the Services page on my website for details or contact me at [email protected] Also, I can help you sell your antique and vintage items. Details are also on the Services page for consignments. Finally, I am a USPAP compliant accredited appraiser in all types of silver with the AAA. If you need an appraisal of your silver objects, please contact me and see the Services page for details. This installment of Auction Finds of the Week returns to Boston for Skinner's American Furniture and Decorative Arts sale to be held on 27 February 2016 to look at four very unusual and distinctive decorative arts lots. 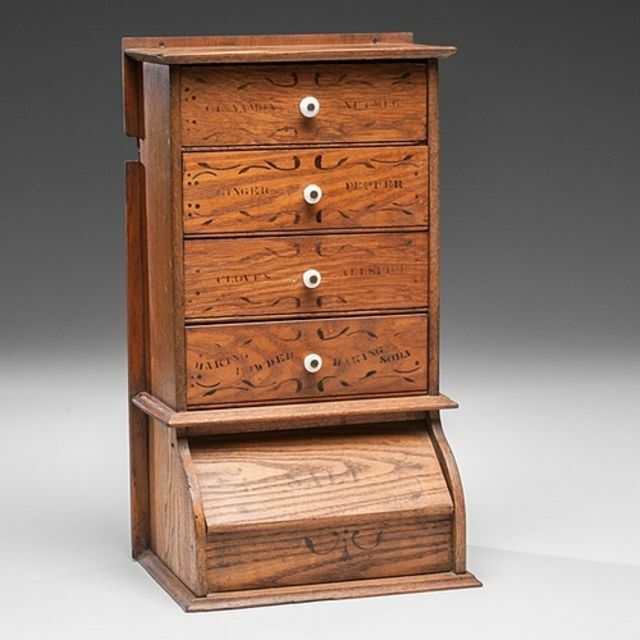 The last installment of Auction Finds of the Week featured four pieces of furniture from this same upcoming Skinner sale. This week's finds all would add a unique presence to a room and certainly be a point of conversation and focus. 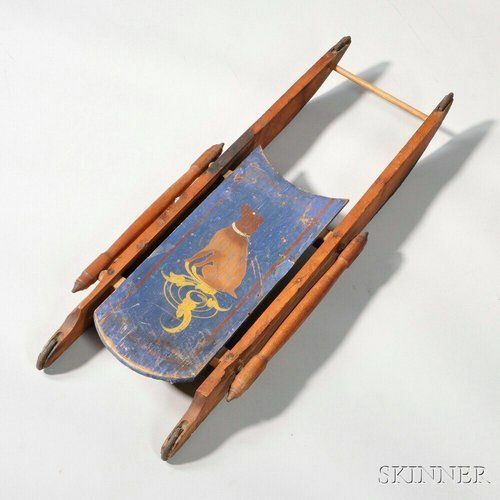 The first discovery this week is lot 475 with a pre-sale estimate of $300-500, a 19th century painted sled. It has a red stained frame with iron runners and a blue deck with red striping. The deck is decorated with a brown dog depicted in the center and a wonderfully abstract design in yellow. The whole piece has a wonderful patina. I would love to see it hung over a mantel or sideboard in place of a painting or mirror. Use its colors to design the whole room. It would add a touch of whimsy and history to the space. 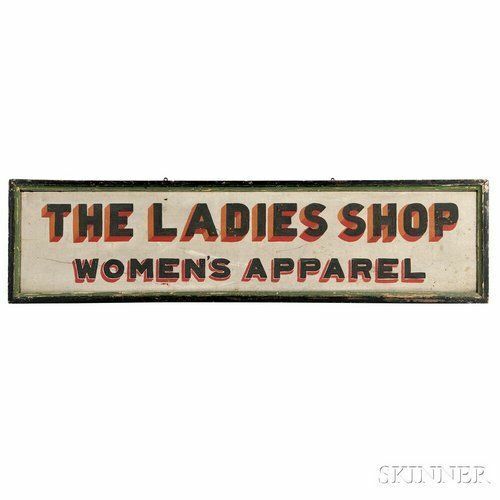 The next find this week is lot 476 with a pre-sale estimate of $800-1,200, a large (19" H x 72" W) rectangular, vintage advertising sign which states: "The Ladies Shop Women's Apparel" lettered in black, red and orange with very smart drop shadowing on a white ground. The whole is surrounded by a green and black molded frame. Old advertising can be a great addition to an interior space and the modern graphic nature of this particular piece would work well in today's settings. Like the sled, this sign would look fantastic over a mantel or sideboard instead of a painting or mirror and would become the dynamic focal point of the room. The third discovery this week is a bit macabre, but still quite fascinating. 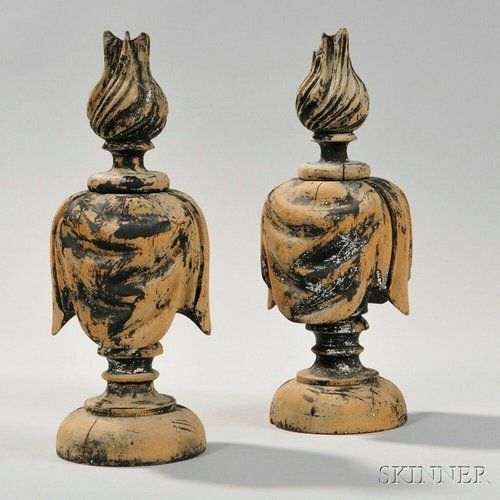 Lot 405 with a pre-sale estimate of $300-500 is a pair of 19th century carved and painted hearse finials. The finials are black painted pine (with most of the original paint now gone) in the form of draped urns with flame finials. The hearse finials stand 14.25" tall and could be used on a mantel or sideboard or as objects to mix in with books in a large bookcase. Certainly this item is not to everyone's taste, but could appeal to those who like the unusual and different. The final treasure this week is lot 451 with a pre-sale estimate of $1,500-2,500, a late 18th century carved and painted milliner's head. The woman's head is subtly carved and painted depicting her facial features, jewelry and dress details. 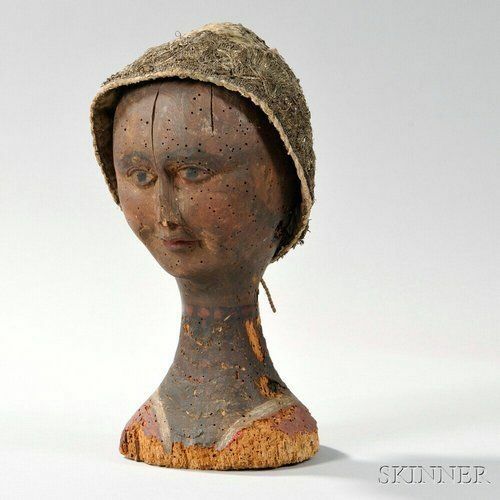 She wears a silk and linen bonnet with metallic sequins and thread decoration and stands 12" tall. A very expressive and evocative piece, it could find a new home on a mantel or sideboard or in a large bookcase. I hope you enjoyed this week's auction finds. When designing your space, think about using objects other than ceramics, glass and artwork to accessorize the setting. Why not hang an old sled on the wall or find a graphic, vintage advertising sign that can add an unique quality to a modern space. Look for unusual items like store displays and other commercial items such as the milliner's head and the hearse finials found at Skinner. Such pieces will become a focal point and conversation piece for your room. If you would like me to help you find distinctive accessories for your room contact me at [email protected] and visit my website to see how I work. I am also an accredited appraiser USPAP compliant for fine American, English and Continental silver. If you need an appraisal of your silver, please contact me.